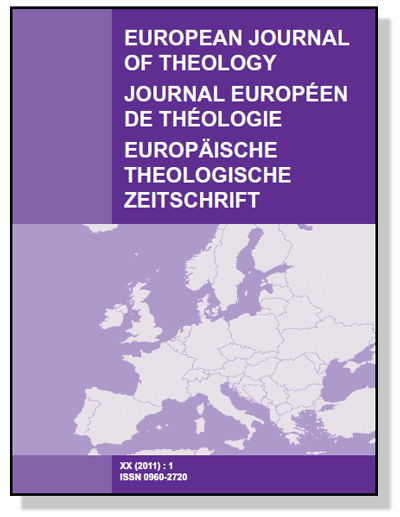 The European Journal of Theology is a tri-lingual theological journal. For those not familiar with it there is a short video introduction below. To subscribe, please visit the publisher’s website. I have just uploaded most of the 2011 articles by permission of the editor and the authors. Below is the table of contents for 2011. Please visit the full table of contents pages to download the articles. I. Howard Marshall, “Evangelical New Testament Interpretation within the contemporary scene,” pp.4-14. Christoph Stenschke, “Judaea in the First Century AD. A Review of recent scholarly contributions and their implications,” pp.15-28. W. Creighton Marlowe, “The Sin of Shinar (Genesis 11:4),” pp.29-39. Ed Mackenzie, “The Quest for the political Paul: assessing the apostle’s approach to Empire.” pp.40-50. John E. Colwell, “Theology, Piety and prayer: on the study of theology,” pp.51-59. Patrick Nullens, “Dietrich Bonhoeffer: a third way of Christian social engagement,” European Journal of Theology 20.1 (2011): 60-69. Krish Kandiah, “Authentic Evangelism? Revelation, truth and worship in late modern, pluralistic Europe,” pp.100-110. Johannes Reimer, “European Christian Renaissance and Public Theology,” pp.111-118. Stefan Paas, “Prepared for a missionary ministry in 21st century Europe,” pp.119-130. Elizabeth Pinder-Ashenden, “How Jewish thinkers come to terms with the Holocaust and why it matters for this generation: a selected survey and comment,” pp.131-138. Svetlaba Knobnya, “God the Father in the Old Testament,” pp.139-148. Stephen M. Garrett, “Beauty as the Point of Connection Between Theology and Ethics,” pp.149-158.